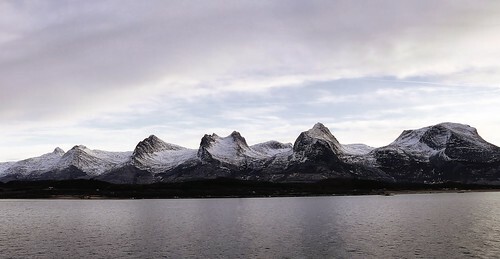 Today a 2 photos stitch of this well known mountain range at the coast of Helgeland, Norway. Photographed from the Hurtigruten going South from Sandnessjøen. De syv søstre (The Seven Sisters) is a mountain range on the island of Alsten in Norway. The range is popular with hikers and offers scenic views over the surrounding area. On clear days visitors can truly understand why the surroundings are called "The kingdom of the thousand isles" by the local populace. All the peaks can be climbed using marked paths, and on every summit there is a notebook where visitors can write their name. After visiting all peaks, hikers can contact the local tourist association which will issue a certificate as a testimonial of their achievement. There is no time-limit for climbing all the peaks. The record for the quickest visit to all peaks is under 4 hours. A good view of the mountain range can be achieved traveling by sea in the "Hurtigruten", as it passes the full length of the range.